A joint project from Project.DWG and LOOS.FM was recently revealed; a temporary structure project in a community park in The Netherlands. The project, titled the PET pavilion — which follows the elevated and structural framework of Ludwig Mies van der Rohe’s Farnsworth House –, aims to focus on rethinking the ways buildings are developed, built and utilized through the usage of sustainable building, recycling, and waste. 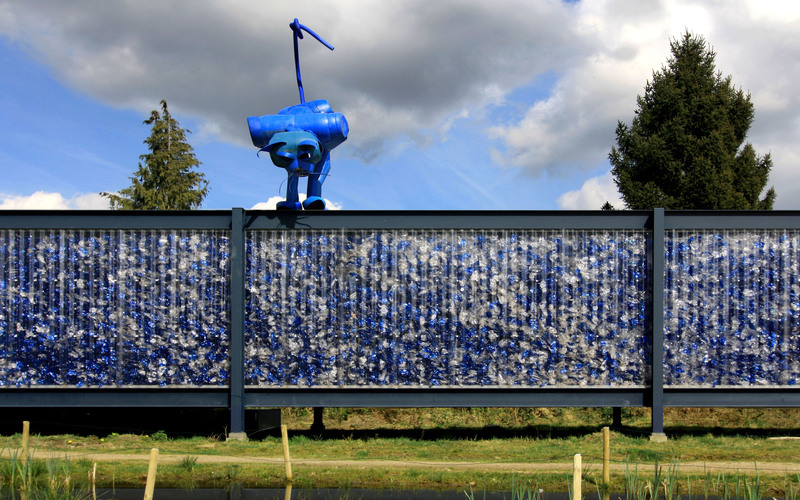 To be more specific, the PET pavilion is a study to educate and explore new possibilities of the use of a building material made of plastic waste, rather than a be-all-end-all sustainable solution. 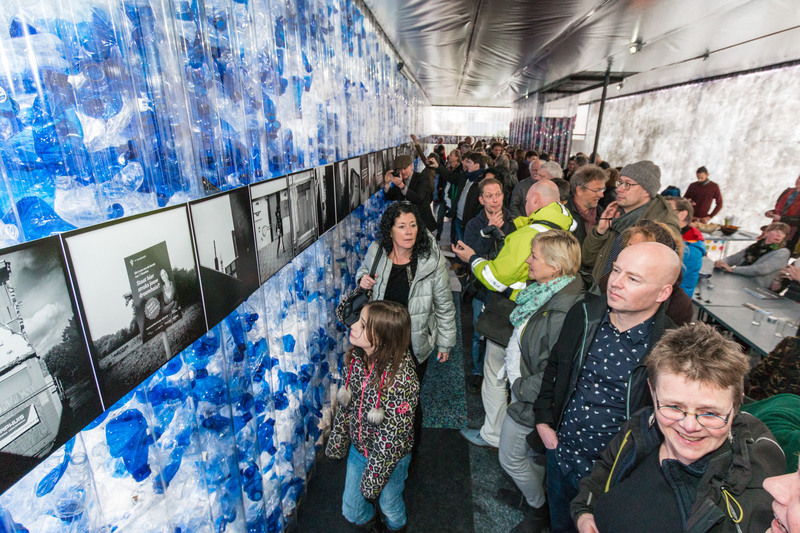 The building consists, from floor to ceiling, double-walled transparent corrugated sheets that hold well over 40,000 plastic bottles, where the bottle caps attached to bottlenecks support the system. In fact, the overwhelming number of bottles used in the project are primarily used to highlight how much we consume products and produce waste. This, hopefully, will help the visitors become more educated as to where their waste goes, and/or how it could be reused and re-purposed. 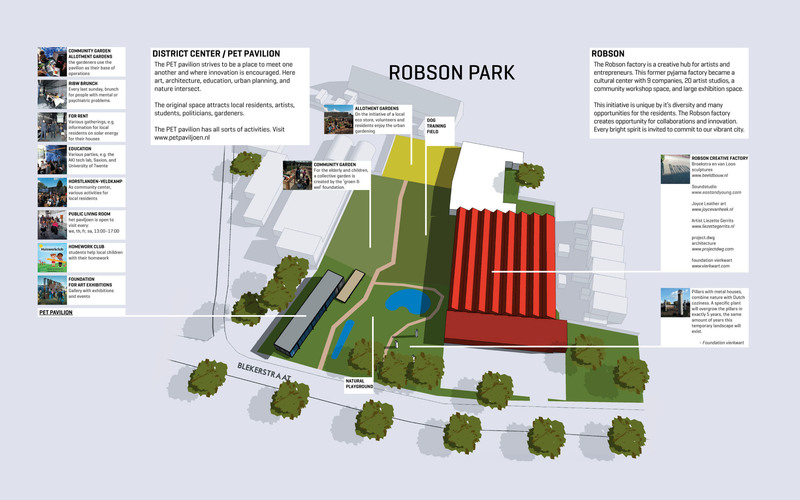 The pavilion plays host to art exhibitions, interactive events, community meeting place, and even holding forums for the neighborhood council. Also, unlike many other permanent buildings mostly made of concrete, aims to showcase that a “temporary building can fully serve its purpose, before being reused or recycled, without losing material value.” Other features include a series of reclaimed glass panels that create a winter garden on the sunny side of the pavilion, which also include seven large pivoting doors that open the entire corner of the structure to the park where the building is installed.